Wander Hooded Jacket- Mens is rated 4.6 out of 5 by 13. Rated 5 out of 5 by emubadger from AWESOME Bought this for my husband to replace his decrepit, but still most beloved, merino hoodie. Frankly, I was nervous this may not make the cut. But holy cow, this hoodie blows his "favourite" out of the water! I'm wary about buying online for sizing issues, but this does fit exactly as described. The pockets are AMAZINGLY deep and zip up -- he can keep so much stuff in there and not fear it falling out. The fabric is wonderfully soft, and the colour is true to what I saw online. It seems durable, and I'm sure he's going to put it to the test. Thanks, Icebreaker, for getting him out of frayed sleeves and thinning fabric and into LUXURY. Rated 4 out of 5 by JosephT from Quality products I have just purchased and received a variety of products for my trip to India next month. I am looking forward to seeing how the Merrino Wool holds out. So far, they look to be high quality products which have been made with care. My wife has since purchased some as well and we are ready to put them through their paces. Love that we can get this in Canada. Only downfall would be the somewhat high price, but we will see what the durability is like during our 5 week trek! Rated 5 out of 5 by mishmcd from Most comfy travel hoody! Brought this as a travel staple but have ended up wearing it everyday around the house, can't seem to take it off. It's super comfortable, soft, warm enough for our new Northern Canadian winters, and just a smart casual good looking jacket. Couldn't be happier. Will be buying another for sure. Rated 5 out of 5 by Pepper1 from Comfy Top The top is a little lighter than expected but still very comfortable with a T-shirt underneath, which is my usual wear. The arm length is good, and the torso length is excellent. 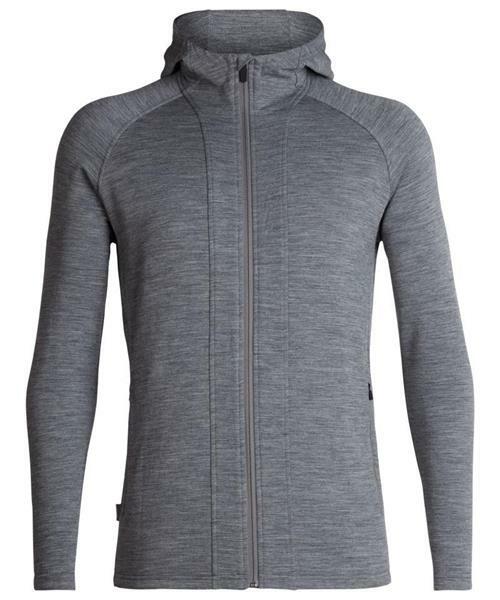 The torso fit is longer than my other Icebreaker hooded tops which is good for colder temperatures. Rated 5 out of 5 by Happycat from An awesome product Bought this for my son for Christmas on his request, to accompany the others he has. He was absolutely thrilled when he opened the package. A score for ice breaker! Rated 4 out of 5 by antares from Everyday warmth I wear this as a midlayer on my walk commutes. It's stays warm and breathable in -20 celsius. I wish there was a chest pocket though for my phone. Rated 5 out of 5 by CozyInTheCold from Makes the bitter winter endurable The winter has been particularly bitter cold, the sweater has helped conquer the cold in total comfort. Rated 5 out of 5 by ch4rlie from One of my favourite hoodies Perfect hoodie to keep me warm when working in my studio. Also great mid layer when going out!